Art is a state of mind. Right? Meanwhile there is one particular Australian artist named @lushsux that wants to see the world burn; in a fun way of course. By painting one viral meme at a time our views will be impacted for a nice yet refreshing image of comedic value or not. Throughout the years art’s interpretation of mediums from what is accepted and effect is largely dictated by the personas of social media. Well, nowadays anyway. Because beforehand, people didn’t really care that much (so it seemed). Things were showcased more so through word of mouth and mysterious map points. Now the life of a meme can be traced through the depths of profiles around the world with one single click. Does the smooth mastermind want us to take anything more from it then that? “No real message, there is plenty of street artists that do meaningful stuff. I just want to get my stuff viral or make someone laugh,” lushsux informs MiddleEasy. You think @iamcardib likes em thicc? I mean, is he wrong? Best caption wins a free ride in the FBI’s very own Party Van! During a recent art show at the Hidari Zingaro Gallery in Nakano Broadway titled “Now This Is Epic” inside Tokyo, Japan, there were works that showcased the animated mind of @lushsux. Standing next to highly respected contemporary artists like Takashi Murakami makes it known that the act of spreading butter in the form of meme art is influencing the right minds. “Meanwhile, MiddleEasy made our way down to Melbourne during UFC 234 where we took the time to check out some of the murals for ourselves around Fitzroy and Brunswick. Knowing @lushsux is no stranger to MMA, he has always been an old school fan. “Been watching mma on and off forever, my step brother would trade mma/ufc vhs bootlegs of all the Royce Gracie fights. The UFC Australia staff are also very supportive of my work, so I can’t complain,” he tells MiddleEasy. In the midst of fight week there was a sick piece of the almost UFC 234 main event which would of included middleweight Champion, Robert Whittaker and Kelvin Gastelum. But some of the other new pieces in theme of the old co-main to new main event between Anderson “The Spider” Silva and Israel “Stylebender” Adesanya seemed to spark throughout the MMA community and the fighters themselves. 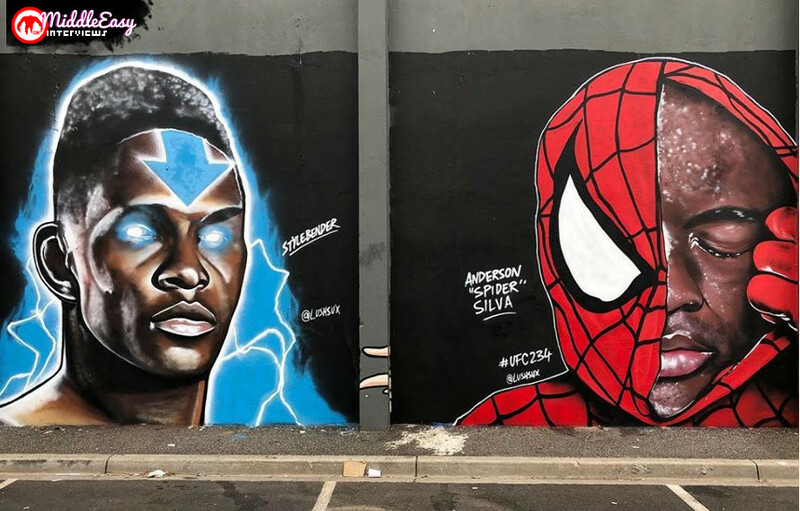 Adesanya, who won against Silva by decision after three rounds, happens to be a big fan of @lushsux has 2 murals painted of him. When asked why, the Aussie explains, “He’s a real gent, also its anime gang sh*t. Weebs might only get it.” It only seems fitting for the “Stylebender” himself given how he also creates art relates a lot of his mind power to anime. During the post fight press conference or UFC 234, we asked Adesanya what he felt about @lushsux and his murals. Knowing that we live in a digital age we as a society are pretty glued to the robots we hold in our hands. As it seems the screen that holds the barrier from the virtual world into the real world starts to mold into one. Memes have been on the uprise since 1993, however the word was created by a man named Richard Dawkins back in 1976. The true meaning resides inside a book written by Dawkins himself by trying to explain the process of how we could possibly advance information through our culture. Is this Goku McGregor it chief? Do you think @thenotoriousmma deserves a rematch against @khabib_nurmagomedov ? There will always be a conversation as long as @lushsux is out there still making us laugh and look at memes and the magic something can have when it goes viral. As Elon Musk of course, because why not? I’m sure Musk is somewhere out in the world admiring the love. Even though he blocked @lushsux. Pretty sure the Aussie has no hard feelings. I mean, let’s try this again. If @lushsux is a bit bummed the lesson learned is we can just meme about it. From great pain comes great art. (well mediocre art actually?) Can I get an unblock lushsux in the chat? Amen. And the world will just be a better place. Especially even when the choice of candy is on topic. On a final note, do you think McGregor should ever get that rematch? Next articleIs Georges St-Pierre Joining ONE Championship?